SHREVEPORT, La. — NFL legend, Emmitt Smith, is scheduled to be the keynote speaker for the fifth-annual Duck Commander Independence Bowl Kickoff Luncheon to be held on Wednesday, August 13, 2014 at 11:45 a.m. at the Shreveport Convention Center, located at State Route 173 in Shreveport, Louisiana. 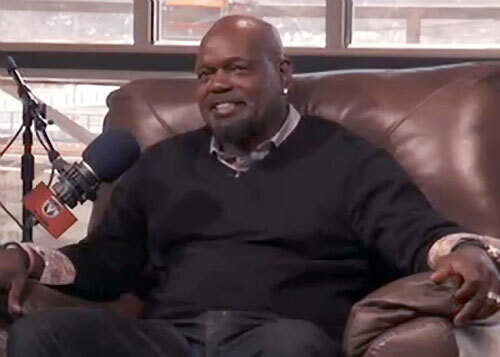 Photo shows Dallas Cowboys running back, Emmitt Smith, speaking with Dan Patrick in Jan. 2014. According Bossier Press and Duck Commander Independence Bowl, to cite sources, tickets for the fifth-annual Duck Commander Independence Bowl Kickoff Luncheon are $50 per seat or $400 for a table of eight. Smith becomes the latest in a line of top-flight speakers for the Kickoff Luncheon, joining Terry Bradshaw (2010), Bobby Bowden (2011), Lou Holtz (2012) and current Dallas Cowboy Jason Witten (2013). Pro Football Hall of Fame running back. Emmitt Smith, helped lead the Dallas Cowboys to three Super Bowl titles, and was named the MVP of Super Bowl XXVII. He is considered one of the greatest running backs in NFL history. Smith was elected to the Pro Football Hall of Fame in 2010, in his first year of eligibility. In the fall of 2006, Smith won the third season of Dancing with the Stars with professional dancer Cheryl Burke. If you would like to book NFL speakers or athletes like Emmitt Smith for a speaking engagement, autograph signing, product endorsement, fundraiser or special event, contact Emmitt Smith’s booking agent for appearance and speaker fees at Sports Speakers 360. For booking agent and appearance fee information on how to hire Dallas Cowboys players for appearances, contact Sports Speakers 360 at 1.855.303.5450.